Experience The Modern Barn® Room by Plum Builders Inc. The Modern Barn’s signature “Great Room” is the centerpiece of the home. Its inspiration draws all the way back to the Great Halls of Medieval times. For Plum Builders, the architecture of The Modern Barn® Room emulates this tradition in a modern way, the traditional elements come from the mass and size of the room. The barn architecture itself is historical, a gabled form with high walls typically two stories. The Modern Barn® Room is spacious and cozy and is the place where families gather together. For many families, this is where they congregate for holidays and family get-togethers. It’s large enough to accommodate extended family and friend gatherings that are common in the Hamptons. Our clients smile when they enter The Modern Barn® Room, as a natural reaction to natural light and the open space. Then, they begin to absorb the details. 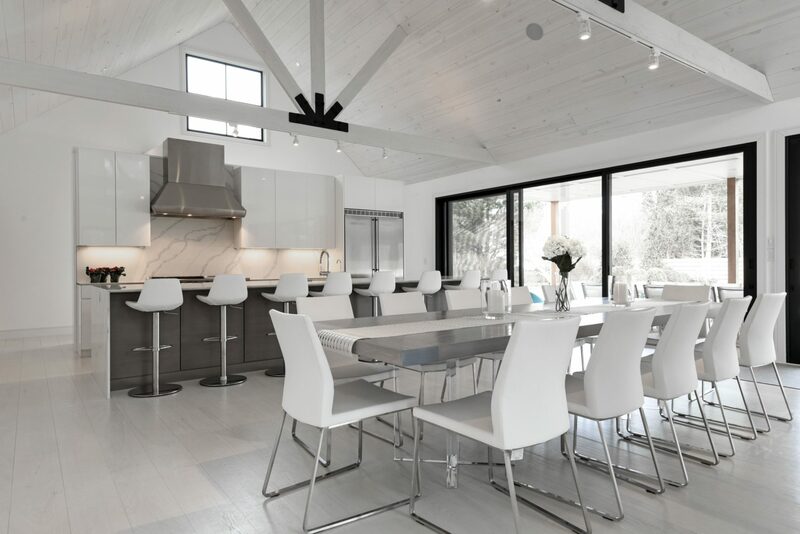 The Modern Barn® rooms incorporate three spaces into one: living, dining, and kitchen. With boundaryless living areas, families can be together in a single space. The scale of each two-story great room is enormous, marked by cathedral ceilings and oversized retractable doors. One or two walls are mostly glass bringing the outside in and the inside out. The size of the room affords abundant space for 14-18 ft long islands, with a back wall, creating a modern galley kitchen. This is the most popular kitchen layout in modern design. It’s easy to work in and entertain in and socialize with the family. The oversized barn doors in the great rooms are custom designed for each Modern Barn®. Grand stairways create statement pieces for the home and are eye-catching focal points upon entry. 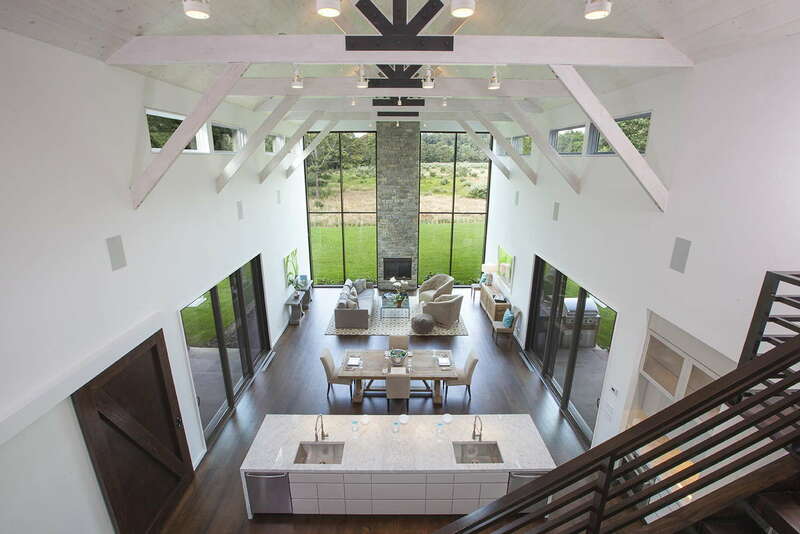 Another signature element of a Modern Barn® great room is the placement and scale of windows and glass doors. The fireplace is the main mass which adds balance to the grandeur space and creates or sets a scale for the furnishings and the people in the space. 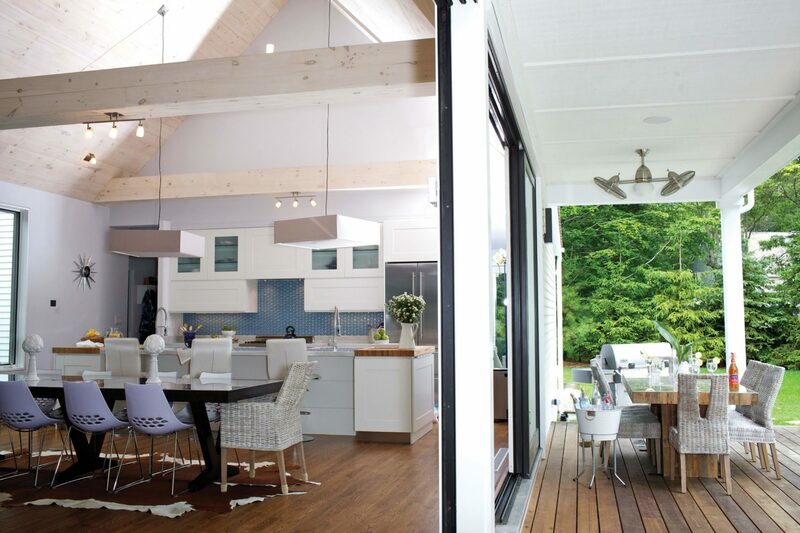 The Modern Barn® Room also provides plenty of access to the outdoors, by way of sliding glass walls. Designed to bring the outside in as much as possible, these elements allow families to connect with nature at all times.